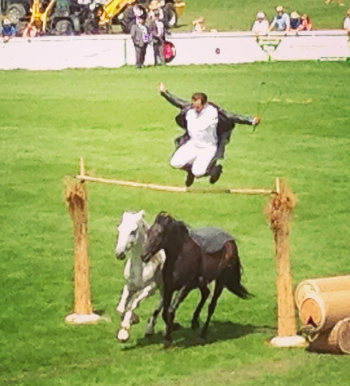 Royal Welsh Show after years away, plus a great leap! 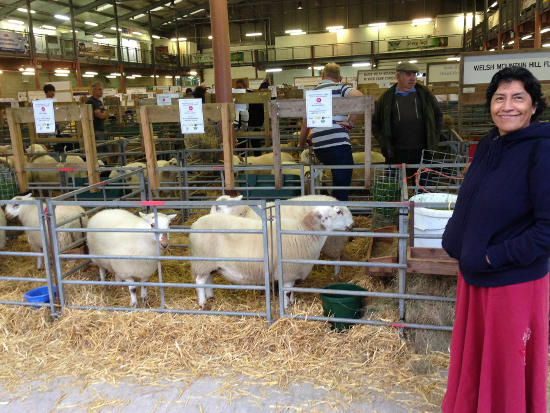 Last week Gladys and I had the chance to visit the Royal Welsh Show again after five years. We had served with a hospitality booth there during the show for several years until that outreach was phased out. 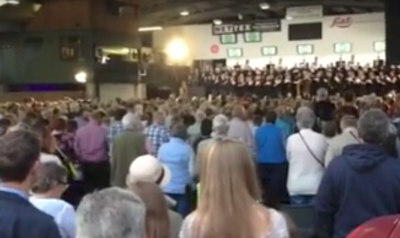 Happily, however, two other organizations provide a Christian witness at the show where nearly 250,000 visitors attend during the four day event. 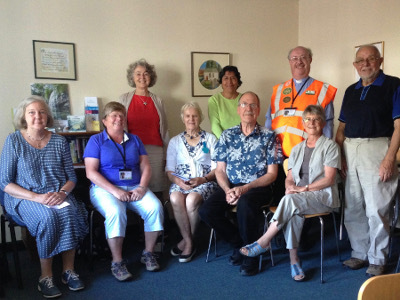 Now also the Christian Centre for Rural Wales has a permanent office there, and there was prayer there each morning, led by different groups. It was good to see some old friends there and make some new ones as well. 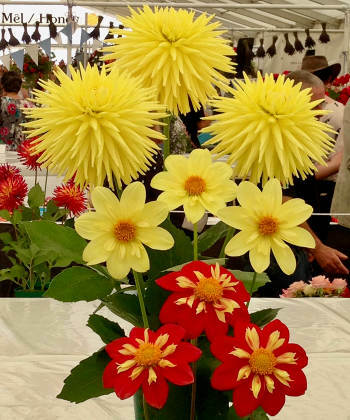 One wonderful part of the show was actually organized for exhibitors and the general public the Sunday evening before the show opened. It is called "Moliant y Maes", which means "Worship on the Show Grounds." There were three choirs from the hosting county of Carmarthenshire, and everyone that wishes to can just join in. The last hymn was "Guide me, O thou great Jehovah", written originally in Welsh by William Williams in the 18th century. I posted a video of the last stanza at this link. Here are the complete words. What a wonderful declaration of our sure hope in Christ! bid my anxious fears subside. land me safe on Canaan's side. I will ever sing to you. We were also invited to come to the International Pavillion, and pin tiny flags into a world map on Guatemala and the USA. It is a good place to meet visitors from other countries, and the question always seems to come up about what brings us to Wales. That is always an opportunity to share about our prayer for revival, and engage people in conversation about the Lord, and their future. There's something about leaving "reason" behind and taking that "leap of faith" that people find so difficult. It can also take a "leap of faith" on our part to talk openly with others about Jesus and God's gift of salvation. And that is where the Holy Spirit is more than able to do His part! In my update of two weeks ago, I mentioned having received a few lasting impressions that I wanted to eventually share. Before things get rolling too fast here again, I want to pass along another one. While in Canada in early June, one day we visited the Blackfoot Crossing Historical Park near Cluny, Alberta, as I mentioned briefly in our June 7th update. As I sat looking out over the valley, I began to consider the historical situation of the incoming settlers and the Indian peoples. This is a far greater issue than I'm equipped to deal with, but there was one aspect of it I felt the Lord really highlighted to me. When the white men came in and basically took over the land, the Gospel came along with them, and over the years the native people were evangelized and some were converted. However they had to adapt to a Western style of Christianity rather than be shown a way of following Jesus that fit in better with their culture of tribe and community. They were most likely taught a "Sunday go to church" form of religion that takes place at specific times and places in the week, rather than their own indigenous spirituality that was involved in most aspects of their everyday lives. The other point that became really clear to me was that of their strong community lifestyle. Their lives and activities involved each other in almost everything. 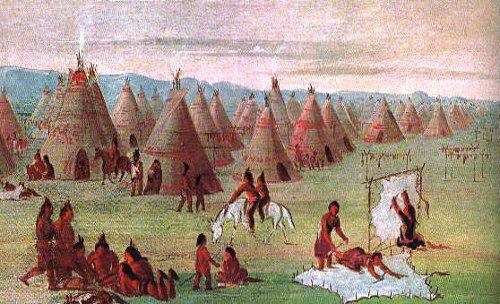 They lived in tepees right next to each other, colaborated with one another in community tasks, and surely conversation and story telling were abundant, and both would have naturally included spiritual matters. 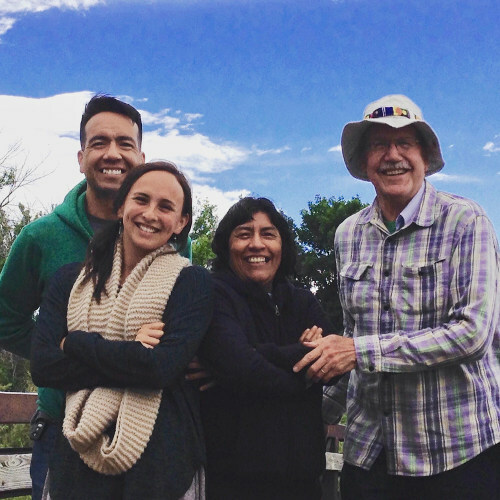 Their tribal communities served to nurture and strengthen their identities and traditional worldviews, right or wrong. Then my focus was drawn to similarities in the historical Christian church. What began as a very community-oriented, "breaking bread from house to house" relational church gradually devolved into the same "Sunday go to church" format that would have been taught to the Indians. And in light of today's highly connected and information-addicted society, it is no wonder that the traditional church format has so little impact on the world around us. Something is sadly and seriously missing. Further reflection on this brought home to me the importance of meaningful personal relationships, and their role in keeping individuals and their communities healthy and strong. In fact, this is high up on God's priority list too. Jesus Himself has an older-than-the-ages tribal connection, being the Lion of the tribe of Judah. When one of the scribes asked Him what was the first commandment, He replied in Mark 12:30-31, "'... And you shall love the Lord your God with all your heart, with all your soul, with all your mind, and with all your strength.' This is the first commandment. And the second, like it, is this: 'You shall love your neighbor as yourself.' There is no other commandment greater than these." I believe that "love our neighbor..." here means real relationships, and that means quality time spent together in a significant context. This is not just a nice idea, it is actually more important than all the other commandments but one! I highlighted that first commandment in the June 25th update. But it is this interpersonal application of "all of your heart, soul, mind and strength" in "building one another up in love" that is so vital to our spiritual wellbeing and effectiveness. 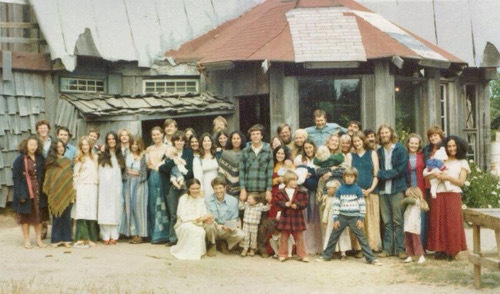 For countless thousands of us that were saved during the 1970's Jesus Movement, it was this tribe-like community practice of our new faith that nurtured and established us in the Lord's ways. Without this intensity of close relationship, I don't know how many of us would have survived. There was a cost to real discipleship, but good fruit remains after 45 years in the lives of many thousands of wonderful saints around the globe. And this is not only true of our own lives and times, but throughout the centuries, God has kept us by His amazing grace. All those "Love one another..., care for one another..., serve one another..." scriptures that we learned and practiced have kept us strong, and together. Though paths and ministries may separated us physically, we all have experienced seeing old friends and acquaintances after a great many years, and it seeming as if it were just a short time. We have remained together in Him, and He is the significant context of our lives. Jesus said in John 13:34-25, "A new commandment I give to you, that you love one another; as I have loved you, that you also love one another. By this all will know that you are My disciples, if you have love for one another." We are living in a world that seems to be racing toward the abyss of total godlessness, immorality and personal insignificance. We have an enormous privilege and responsibility ahead of us as believers. And it is our obedient practice of both of these commandments, with "all of our heart, soul, mind and strength", that will keep the us, Christ's church, vital and effective until His return. Our prayer is that we all be encouraged and strengthened as together we follow Him. A desire fulfilled - seeing our kids face to face! We have been back home now just over a week. Thanks to those of you who have followed our steps and prayed for us. We really saw the Lord provide for us in His marvelous way. 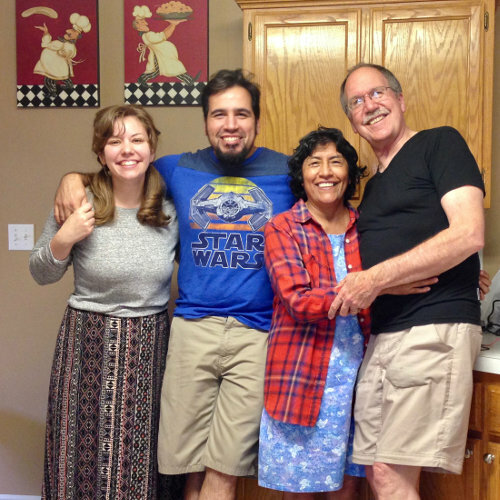 And through His goodness we accomplished exactly what we had prayed for–to see our family! After our time in Canada we got to spend almost a week with our oldest son Peter and his girlfriend Allie in Billings, Montana. He was transferred there by the Marine Corps from South Korea almost a year ago. A big change of culture, but they are enjoying it, and the wide open country. Peter has just passed the 15 year mark and is headed for 20. He has been accepted at Tulane Universityback in New Orleans to start in 2022. Allie is in a master's program at Montana State University Billings. We enjoyed just spending time together and doing some exploring. 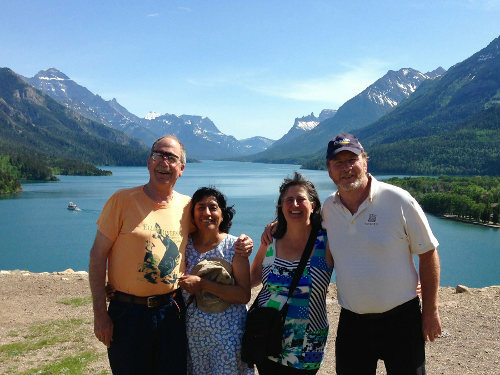 We took off one day headed for Yellowstone Nat'l Park, but got turned back at a 9200 foot high mountain pass in Custer Nat'l Forest by a snowstorm in June! We hadn't been in a place Peter has lived since he joined the USMC so it was a special treat for us. Our next stop was New York City, as you may have guessed from our last update. We had been wanting to visit Dicky and Grace when there were leaves on the trees instead freezing cold, and the Lord granted this petition of Gladys's heart too! 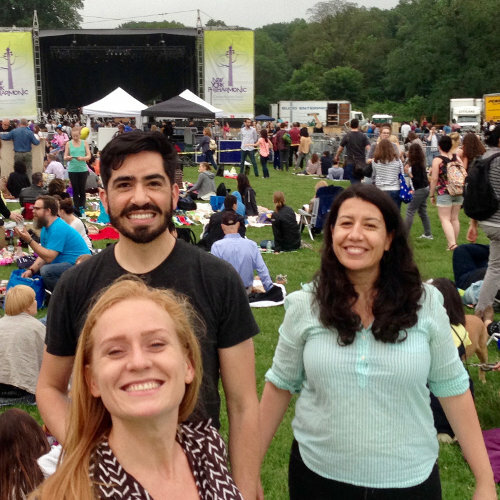 Here we are with Grace and Dicky, and his girlfriend Emily in front of him, at a wonderful concert in Prospect Park. We met up with her parents for a picnic supper with many hundreds of others and had a great time. One of my nephews showed up with his family, who are great friends with our kids, and that made it extra fun for us all. It was a real treat to just hang out with the two of them in their apartment, do some adventuring in the big city, and just be family again. Gladys cooked up some of their favorite meals, and we made the most of being together. Among other things we did was a wander through the Brooklyn Botanical Garden, which was absolutely bursting with flowers and leaves of every imagineable shape and color. Then another day the four of us visited the Statue of Liberty, and Ellis Island. The Immigration Museum there was a very educational and moving experience. I hope to share a little more about that in another update. Our next and final visit was Louisiana to spend time with our son Mike and his wife Lauren in Hammond, about 50 miles northwest of New Orleans. We lost a day when a connecting flight was missed due to some rough weather, but we did manage to have almost enough time together. That weekend was Lauren's dad's 70th birthday party, so that was a special time with a large extended family get-together and plenty of delicious Cajun hospitality! Our time flew by all too quickly, but we couldn't be more delighted to have had this wonderful opportunity. Both Gladys and I still tear up now that we're home again and think back about this incredible trip. We realize how faithful God has been to us over the years, and are infinitely grateful for His care and tender mercies extended to us time and again. Meanwhile back at the ranch... After just three days home and most of the jetlag behind, things are back in full swing. 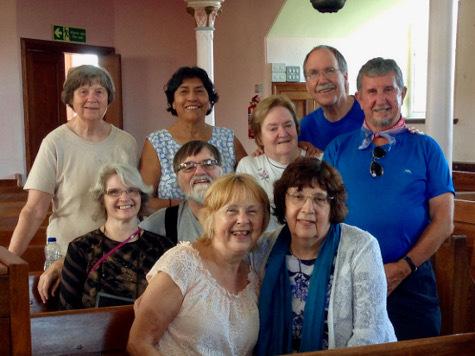 We had three visitors from Birmingham, Alabama, with us several days as part of their assignment to pray around the perimeter of Wales. On Wednesday we were joined by two ladies from South Wales, and were praying blessings over the nation in English and Spanish. Just as I was having a go at it in Welsh, a a couple from Swansea visiting a family grave stopped to have a look inside the chapel. After a brief introduction they joined in the prayer with us, and even prayed a blessing in genuine beautiful Welsh where I could not. We have all just been amazed at God's perfect timing in so many ways each and every day. I'd need way too much time to tell it all here. Suffice it to say that God is so very clearly at work around this land. Please continue to pray for our American friends as they complete their assignment this week. Also pray for an evangelistic outreach around Wales this week called "The Turning." Many churches are working together in nearly 25 communities and in the first 4 days have seen almost 1,500 people pray to receive Jesus as Lord and Savior!